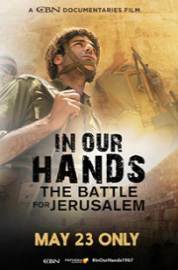 The case of the yard CNN documentary film in our hands: the fight for Jerusalem, which marked the 50th anniversary of the war, six and in commemoration of this historic battle, cinemas, some of the country for the event a Special Night on Tuesday, 23. May In our hands and said that Israels Israels 55thparatroopersBrigade defense forces risk everything for the sake of their homeland. With interviews and first resembles rukeRekonstrukcija history, this docudrama performance focused commitment izhertvoprinoshennia troops reunited Jerusalem. Experience a special interview with Gordon Robertson, because heconsidering the importance of the Six-Day War.